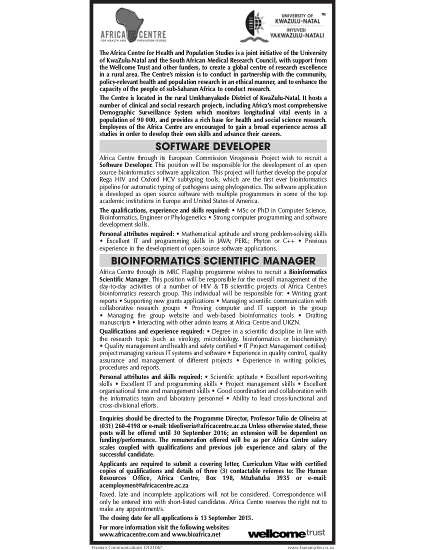 Africa Centre through its European Commission Virogenesis Project & MRC Flagship Programmer wish to recruit a 1) Software Developer & 2) Bioinformatics Scientific Manager. Africa Centre through its European Commission Virogenesis Project wish to recruit a Software Developer. This position will be responsible for the development of an open source bioinformatics software application. This project will further develop the popular Rega HIV and Oxford HCV subtyping tools, which are the first ever bioinformatics pipeline for automatic typing of pathogens using phylogenetics. The software application is developed as open source software with multiple programmers in some of the top academic institutions in Europe and United States of America. - Previous experience in the development of open source software applications. - Interacting with other admin teams at Africa Centre and UKZN. - Ability to lead cross-functional and cross-divisional efforts.